OLYMPIA, Wash. – Oly Town Artesians forward Chris Pugh has been honored by Western Indoor Soccer League club coaches and operators as the Offensive Player Of The Week for his hat trick on Saturday night against the Oly-Pen Force. Pugh, a North Thurston High School and Evergreen State alum, scored three times in the third and fourth quarters, sparking a run that cut a 7-1 Oly-Pen Force lead to just two goals, 8-6, early in the fourth. It was a hard-fought game by Pugh and both sides that saw the momentum shift massively twice over the course of just five minutes, and the Force eventually pulled away to register a 12-7 victory. The 38 year-old has been with the Artesians since the 2015-2016 season, but only played in six games over the past two seasons due to injuries and other commitments. This season, he has played in seven of nine games and has scored seven goals. But most importantly, he brings solid, veteran leadership to a young and inexperienced squad that has struggled on the field. He does all that while being a father to two young children and working his day job with the State of Washington’s Department of Natural Resources. 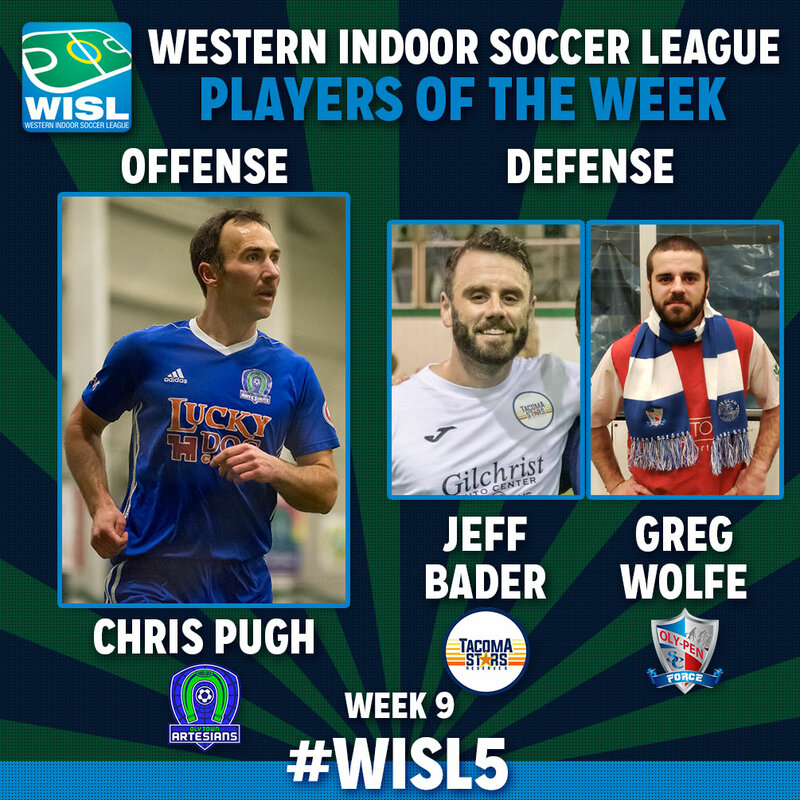 Also honored by the WISL for Defensive Player Of The Week were two more Evergreen State College alums, Tacoma Stars Reserves’ Jeff Bader and Oly-Pen Force’s Greg Wolfe. Wolfe was an Original Artesian, playing in 16 games over two seasons before moving to Seattle. He scored twice, made five blocks and drew the key penalty that smashed the Oly Town comeback bid on Saturday. This is his first season back in the WISL since the 2015-2016 season. Pugh and the Oly Town Artesians wrap up the regular season this Saturday night when they face Bellingham United at The Pavilion at The Evergreen State College. It’s Fan Appreciation Night, with games, prizes, giveaways and more all evening long. First kick is at 6:30 PM. The following week join us for a postseason friendly against the Oly Legends on Austin Kelley Night, an annual event to honor friend and teammate Austin Kelley. First kick for AK Night sponsored by HDR Inc. is also set for 6:30.